AUD is acting weak against its strong American counterpart due to Chinese inflation data. 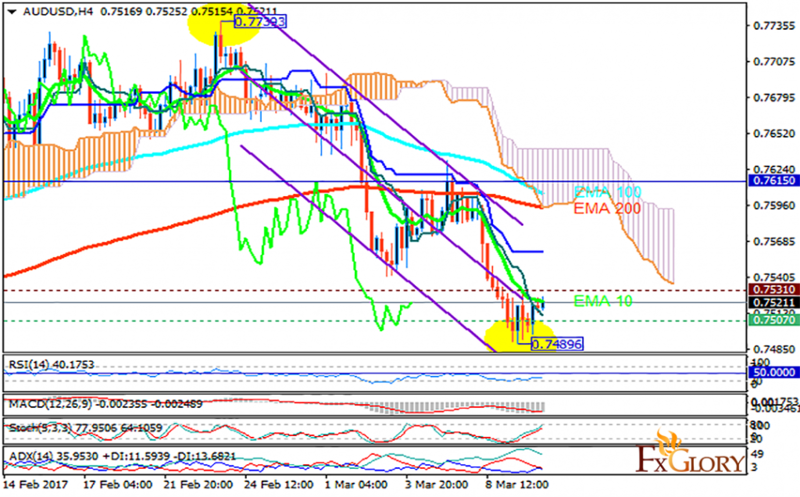 The support rests in 0.75070 with resistance at 0.75310 which both lines are below the weekly pivot point at 0.76150. The EMA of 10 is moving with bearish bias along the descendant channel and it is located below the EMA of 100 and the EMA of 200. The RSI is rising towards the 50 level, the MACD indicator is in negative territory and the Stochastic is showing upward momentum. The ADX is showing buy signals. The price is below the Ichimoku Cloud and above the Chinkou Span. The Tenkan-sen is showing a downward trend while the Kijun-sen is showing a horizontal trend. The support level breakthrough will be a good sign for sellers to target 0.7450 otherwise the pair will start its correction pattern.